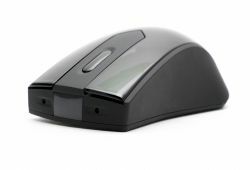 The all new Lawmate Computer Mouse Hidden Camera 720p HD is a great covert solution in the business, home, or office. Its unique design allows seamless HD recording while it lays in wait for up to 7 days on standby, a feat only possible thanks to its built in PIR motion sensor. With its small and light-weight design this mouse can be taken anywhere your laptop can go and blend in just as well. Nobody would expect a simple mouse to contain such a great little hidden camera with such a long life! *Please note: This is not a working computer mouse.